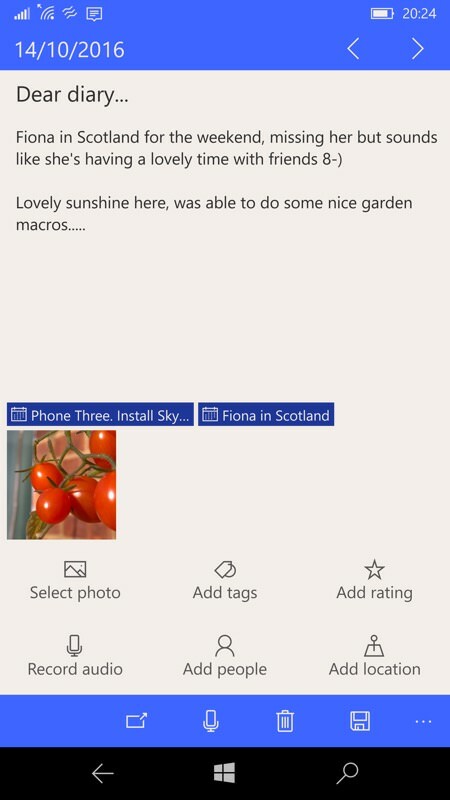 Another top UWP app for you today, running on anything with Windows 10, but with a mobile-optimised UI in particular. 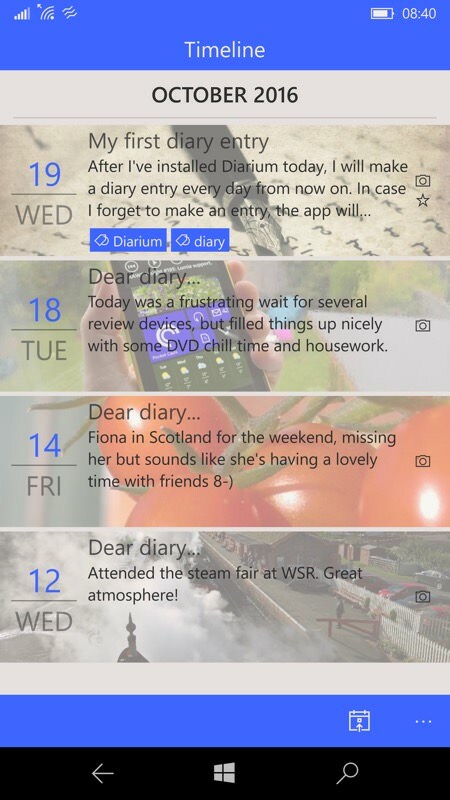 Diarium, as it sounds, is a daily diary - not a new concept on smartphones, but particularly well done here, integrating captured media and social activity into a computerised and exportable whole. Diarium is a commercial application and set at just less than £4 currently in the UK Store, but the benefit of investing in an app in this way is that the developer gets enough income to warrant supporting and updating it - Diarium has been getting weekly updates since its release - very impressive. Not that it's perfect yet - layout on a larger (e.g. 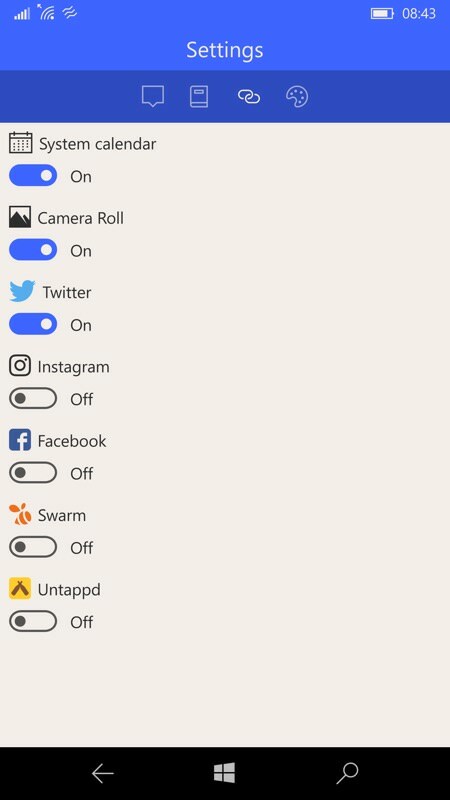 Continuum) screen is often sparse, plus the sync option seems to be at the database level rather than at an entry level, meaning that if you've edited entries on two different devices (e.g. PC and phone) then you're going to lose data overall if you're not very careful. Sync needs to be foolproof. 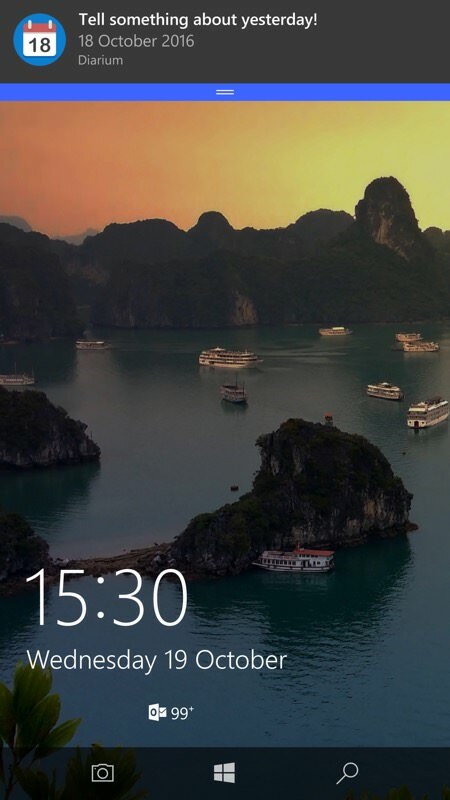 The 'timeline' view works well enough in a large Continuum display, but it's stretched and other views are more sparse. Developers really need to work on adapting UIs more flexibly to cope with both a portrait phone screen and a landscape desktop/Continuum screen. Or maybe this is partly Microsoft's problem? Or maybe it's destined to always be a compromise? 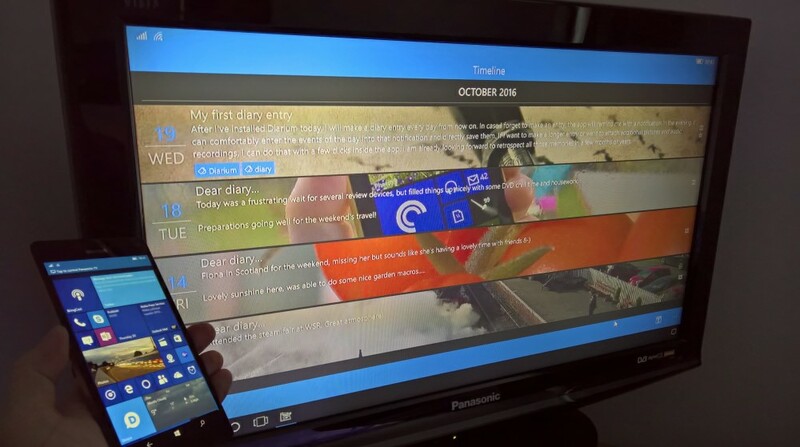 Some of Microsoft's core applications transform into a 'two pane' style UI when in landscape on the 950 XL or in Continuum mode, so there are clearly things which can be done. The default monthly view (left) lets attached photos shine through, which at least give some visual clue as to what happened when; (right) writing up my diary, with my memory prompted by the first few words of tweets I sent during the day (sadly the hyperlinks on these are currently broken) and by photos I took, with the option to attach any or all to the diary entry. 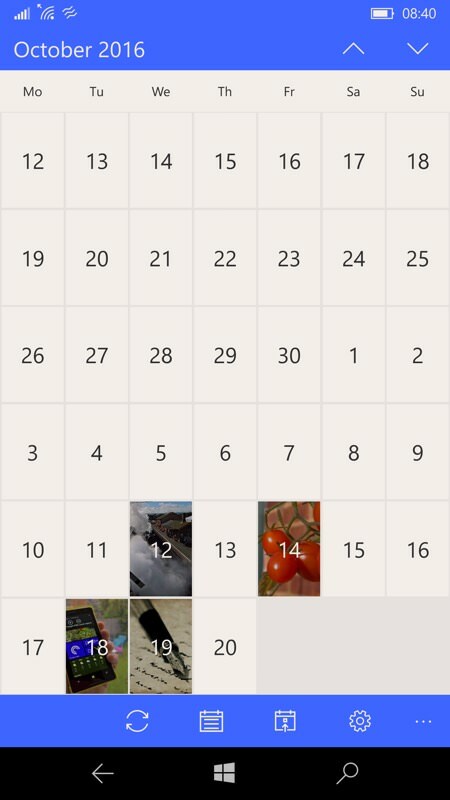 Calendar entries are also shown (here with tweets disabled, so that you can see the former) - they all help jog the old grey matter as to what happened 'yesterday'. 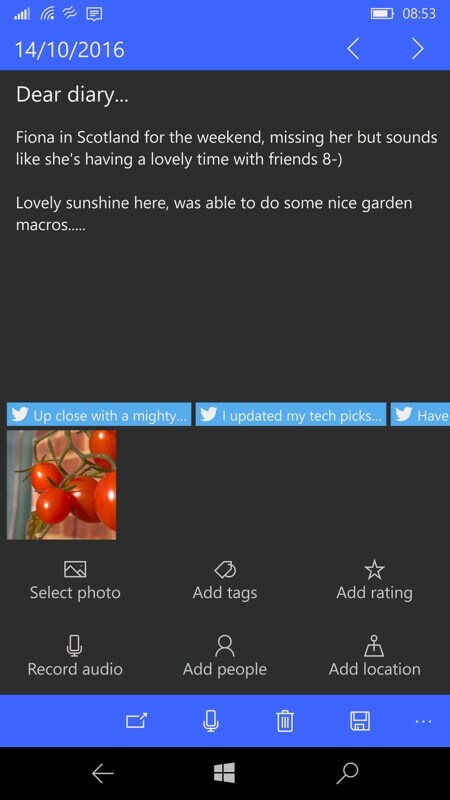 Note also that I'm switching back and forwards here between dark and light 'themes' - Diarium is equally at home with both; (right) the 'timeline' view is a good way to browse your diary entries in one go. 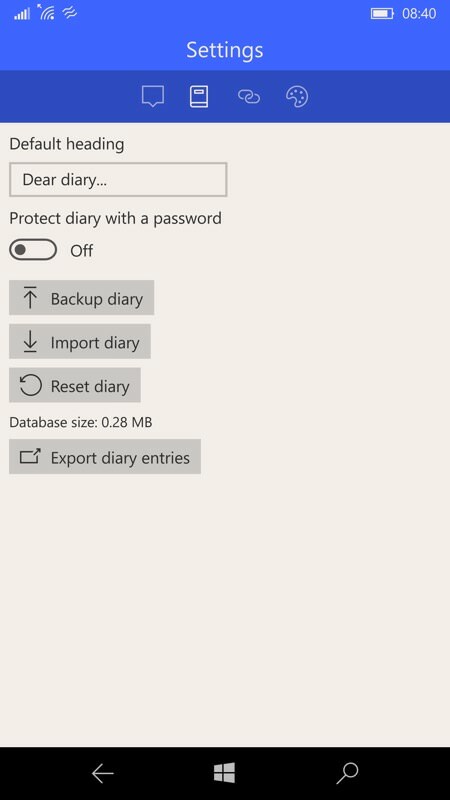 Password protection and various import and export functions give ways to get your diary data 'out', though in most cases this will probably stay on your phone most of the time, auto-backed up to OneDrive by Windows 10 Mobile, in addition to the sync feature of Diarium itself. So, in theory, you're doubly protected! 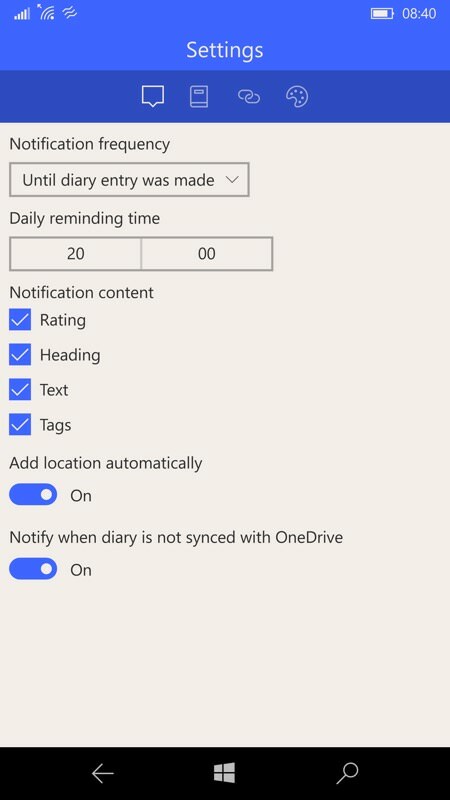 (right) In addition to Calendar, photos and Twitter, you can authenticate with several other social and blogging services, each jogging your memory at diary-writing time if they have content from you for that day. You can buy (invest in!) Diarium here in the Store. It's worth it - and it's an application that will continue to improve through the rest of the year and beyond, I'm sure.